Dimensions (HxWxD): 5" x 4" x 2"
This gorgeous 5" long Large Multipoint Glittering Celestite specimen, weighing 2.75 pounds, is filled with a treasure trove of druzy crystal points with a rich deep cerulean blue coloration, making this gorgeous geode both a mineralogical collector's item and a Lightworker's power tool! 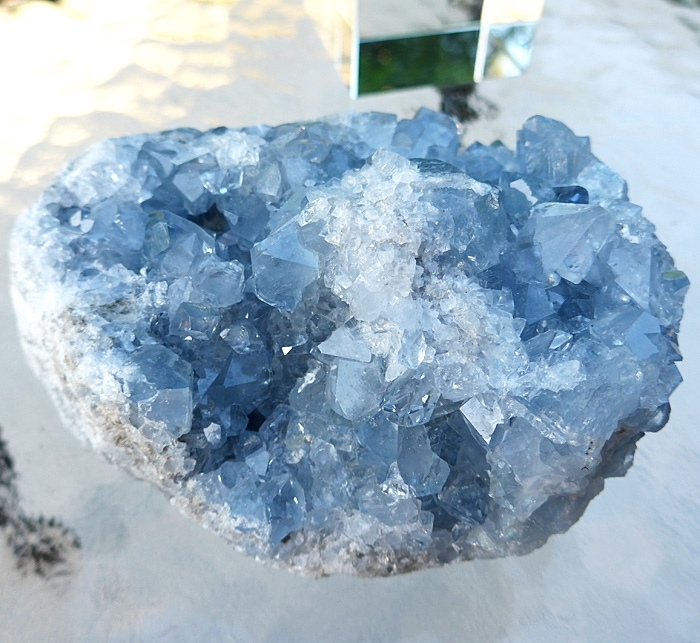 This celestite geode is filled with beautiful orthorhombic shaped crystals, and can radiate soothing energy in every direction throughout your chosen environment! Celestite enhances the bearer's ability to speak their own truth in such a way that it is easy for others to accept and understand. Celestite is said to infuse the user's mind with the ideal of service to the world, and to help the user develop a strong commitment to furthering the spiritual development of all humanity. This same property provides the user with increased access to the akashic records, the energetic templates containing the patterns of perfection that govern the birth, growth and development of the human body (the microcosm) and the universe (the macrocosm). Jane and I have placed Celestite clusters near our computers to optimize and equilibrate the flow of electromagnetic energy in and around our computer network, and to facilitate communication with our Guides and Teachers while writing articles for Satya Center. 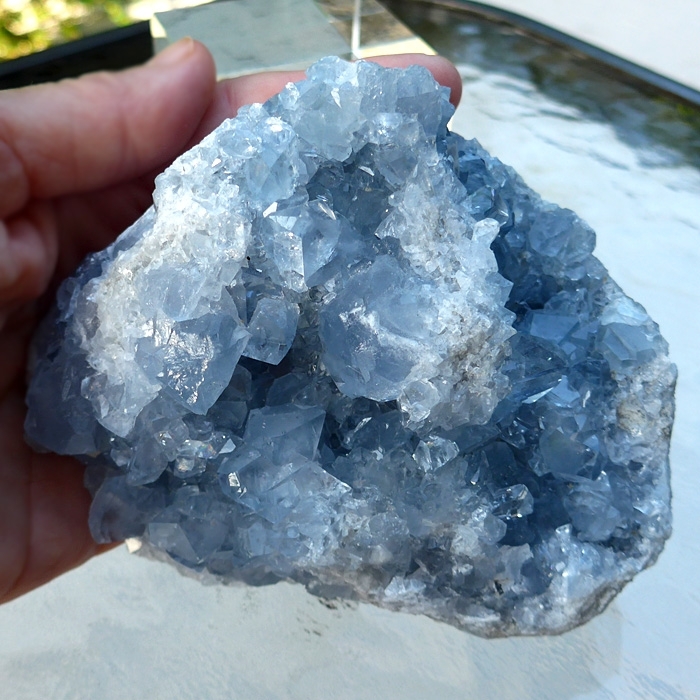 Over the years we have added Celestite clusters to several spots in our house where people gather, such as on our mantle in the den, and we have found that the energy of Celestite helps to create an energetic atmosphere that visitors find soothing and conducive to good communications! Celestite is a very soft stone. Do not immerse Celestite in water to clean it, and be careful when applying liquids of any kind to the stone. Be sure never to drop the Celestite cluster, because it will fracture. Always keep it safe from harm. 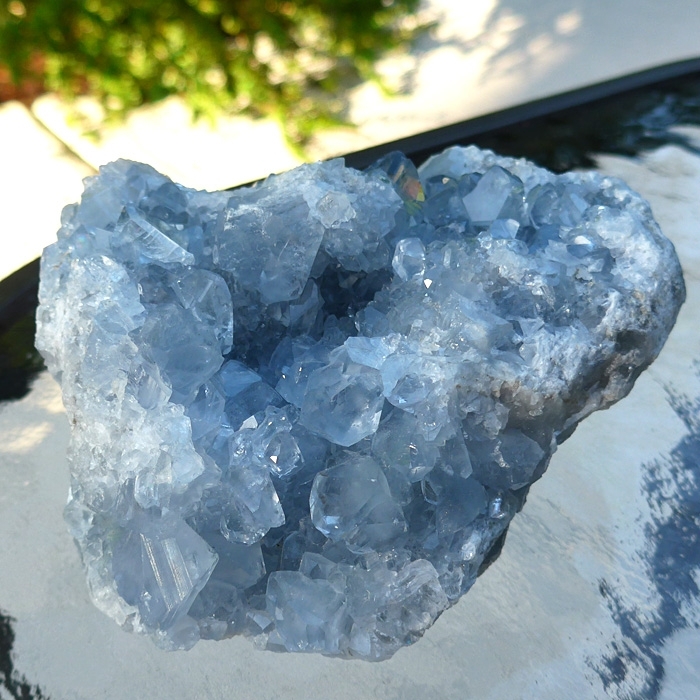 The Celestite cluster is a powerful, beautiful gift from Mother Earth and must be treated with respect. Above weight is shipping weight. Actual weight of this stone is 43.95 ounces or 2.75 pounds.